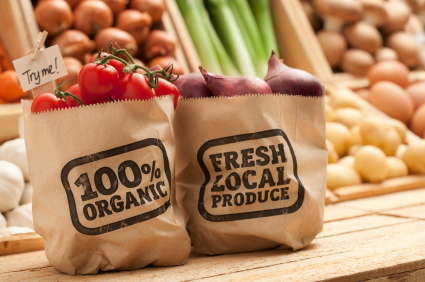 Organic, especially recently, has become a buzzword, a trend. I go to Whole Foods. I buy organic! I must be saving the environment, right? Well, to answer a rhetorical question: "Not exactly." To start off, if your organic food is coming from California, say, (assuming you live on the East Coast) or better yet South America, there is a lot of energy expended to ship said foods across the country or world. Agriculture uses about 20% of all of consumed oil resources in the United States yearly. That's a pretty staggering number, falling just behind the amount of energy passenger vehicles expend. Of that 20% only about one-fifth is used on the farm. The other four-fifths is used for travel, processing, packaging, more travel, refrigeration, etc. That being said, a lot of energy, too much, goes into what happens to your food after it leaves the farm, and, in that case, whether or not it's organic doesn't really matter. The point being, in this type of situation, organic is just trading one problem (i.e antibiotics, fossil pesticides) for another (unsustainable food travel). There are actually studies out there that claim the average distance organic food travels, from farm to plate, is actually further than the 1500, or so, miles the average food piece travels. Wowsers. Now, just for example's sake, let's say you decide to stick to your guns and make a difference. Yeah! Good for you! You say, "It's time that I start treating the world better, reducing my carbon footprint and I'm going to eat organically, and more locally." Is this better? There are studies out there that say "no," and others that say the opposite. Truthfully, I'm not entirely sure, in terms of energy use, which is more efficient. Stocking railroad cars full of produce packed tightly and rolling them across the country may, very well, consume less energy per vegetable than a local farmer driving his truck, partially packed, to a farmer's market. (Who knows if this farmer can even sell all of that produce?) What I'm talking about here is more a problem of moving away from localized diets over many, many generations, and becoming accustomed to having whatever you want, whenever you want it. Our agricultural infrastructure that took decades to develop for our globalized agriculture has decimated our local infrastructures, and due to economies of scale, has commoditized everything we eat. It's, as Joel Salatin says, a "faster, fatter, bigger, cheaper," mentality. This fossil fueled party may very well, for now, make it more efficient to eat a salad from California (again assuming you're on the east coast). This type of thinking may just be a blip, short-lived, in the whole of human history. The idea of compromising one ideal for another continually comes to the forefront when thinking about what you eat: Even if it's organic. For instance, the other day I was reading the side of my organic raisin bran and posted on the side was the "USDA Organic" definition. It pointed out that organic products are not always 100% organic. There may be exceptions for some ingredients, so producers have only to reach a 95% organic composition to be labeled "USDA Organic." This type of "loophole" is not something that is completely obvious, and, at times, downright misleading. Organic...or is it? Come on! That being said, it makes more sense to use your common sense when it comes to your food. Whether you are buying from the supermarket or anxiously harvesting from your backyard garden you're going to be incorporating what's in/on your food into what will be you. You are what you eat. I personally have decided to grow as much of my food by myself as I can. Writings initially by Michael Pollan, but then by Wendell Berry, Joel Salatin, Joan Dye Gussow and a slew of other writers really opened my eyes to the fact that what you eat can really affect the world around you. I also felt it was one way in which I could make a personal impact. Wendell Berry says that, "Eating is an agricultural act." Our collective decisions do impact our immediate environment. I'm hoping to bring some people along with me, producing some of their own food, reducing waste, or converting waste into something useful, and overall, just living a more healthy sustainable life. I hope this gets you as excited as I am about gardening organically and in the weeks and months to come, I'll have more articles that will be more practical, and helpful in the garden. Whether they are about pest problems, fertilizing organically, composting, seed saving, or one of any number of trials and tribulations that my garden presents, I'll be here to let you know how it's going, and anxiously waiting to hear what's happening in the wild world of gardening. Until next time, let's garden responsibly. Get gardening tips in your inbox! Find garden outings and supplies in your neighborhood! Gardens.com is © 2018 MH Sub I, LLC dba Internet Brands and part of the DavesGarden family.